Day two of the countdown finds us in uncharted territory with Keith Deininger and his novella Shadow Animals. Saul, who has lived his entire life on the edge of the Copperton Forest--known for its strange and unusual wildlife--knows little about what stalks him. He knows only that it is dark, and powerful, and unnamable--and that it has stolen his nine-year-old son, Ezzy, from him. "Shadow Animals is a nightmare journey into the realm of the fantastique. Deininger's surreal narrative is a live wire of suspense that crackles with tension. Who'd have thought the gates of hell were hidden in the New Mexican wilderness?" 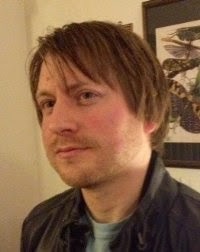 An award-winning writer and poet, Keith Deininger is the author of THE NEW FLESH, FEVERED HILLS, MARROW'S PIT, and GHOSTS OF EDEN. He grew up in the American Southwest and currently resides in Albuquerque, New Mexico with his wife and their four dogs. He is a skeptic and a bit cynical. When Keith was in first grade, he started a fire in the woods behind his house, but his father discovered it before the flames grew out of control and stomped it out with his foot. After that, Keith began to write. In fourth grade he wrote a story about a boy who wakes up to find everyone has disappeared and he is alone. In high school he won first place in a writing contest in Los Alamos, New Mexico and was presented with a check for one hundred dollars and his first writing credit by Ray Bradbury. In college he won a Conceptions Southwest editor's choice award for his poetry. Although he went to high school in Los Alamos, New Mexico--the birthplace of the atomic bomb--he grew up in Colorado Springs, Colorado. He's always been a bit of a nerd, from playing Dungeons and Dragons to collecting Magic cards voraciously for many years, including competitively and in tournaments. The closest he ever came to playing sports was community youth soccer and hacky sack with his friends. Most members of his family are either scientists or engineers. His wife is a teacher working with kids with autism. He is the black sheep artist in his family and proud to call his work "dark," "fantastic" and "disturbing."